Most businesses are only as good as their people and to ensure that only desirable and qualified personnel are hired, an efficient employment application is necessary. If you are a business owner, employer, human resources professional, or simply an individual wanting to hire a babysitter or personal assistant, this downloadable employment application template will benefit you. This template takes the guess work out of creating an application and provides a professional layout available for you immediately after download. Knowing the applicants job history, criminal history, education, references, and basic profile data is critical criteria when making hiring decisions and this templates gathers this information. The Word template is downloadable and available for free on this page with customization options. 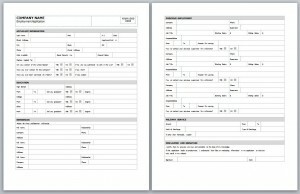 One of the first steps in utilizing the employment application template is to make it yours by customizing it. To brand the template with your company data, logo, company name, address, and other contact information should be entered into appropriate customizable fields and the file should be saved. Leave specific data that is desired on the form and incorporate new fields of inquiry for the prospective employee to fill in. For example, data requesting education details or references could be made obsolete or you could include sections requesting driving record and license history for a driving position. Determining if the applications will be filled out digitally or on paper and making the applications available by the applicable method. Be sure to take full advantage of customization options – Incorporating the company logo, mission statement, contact information, and other identifying information creates a more professional and stable atmosphere for current employees and applicants that fill out the employment application template. Including additional specialized sections on the application may remove the need for time consuming follow up questions or inquiries. Market applications to appropriate audience – Applications that are filled out online or on paper will need to be made available to feasible applicants. Distributing the employment application template to a local job service center or making links available to it at online job search websites may be necessary. Have decent response time to applicants to increase the job market’s faith in their applications not being filled out in vain.